I decided to have a go at a different kind of tagine tonight. It hadn’t struck me to use fish, so when I saw this recipe in the little book that accompanied my tagine I thought I’d give it a go. The book also told me that I was supposed to “season” my pan before I first used it. I hadn’t so subsequently have “greatly reduced its life span”… A tad dramatic I think. Anyway, the fish was delicious. Give it a go. Cut the fish into bitesize chunks. Mix the garlic, cumin, ground chillies, harissa, lemon juice and salt in a bowl. Pour over about 1/2 of the mixture over the fish and carefully coat well. Set aside. 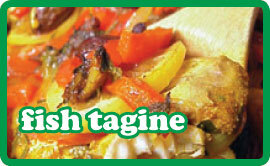 In a large lidded casserole or in a tagine, heat the oil over a medium heat. Add the rest of the spice mixture to the pan and fry for about 30 seconds, add the chopped tomato and cook for 2 minutes. Add the potatoes and cook for another minute. Now add the fish, green capsicum, sliced tomato, preserved lemon, and olives. Add the vegetable stock, and 1/2 cup water. Stir gently to a boil then put on the lid and reduce the heat to very low and cook for 1 hour stirring very carefully once in a while. This is a meal in itself so serve with some fresh crusty bread and nothing else.